10x Monster Points can now be generated from descend boss drops during special events. That means what used to be 10 Monster Points now becomes 100. This may seem insignificant considering that an MP Dragon costs 300,000; but remember, every raindrop raises the sea. And that raindrop becomes a thunderstorm when repeatedly farming the same dungeon over and over again. For Mantastic and Fantastic, it means Scarlet Descended – Mythical Plus as I want to have a Scarlet System (about 55% complete on Mantastic) and it has an amazingly high Monster Point drop rate as you can have up to 802 per run if you sell all the drops. This is quite fantastic considering it only costs 25 stamina and awards 46-49k rank experience per clear. I also wish to examine the viability of farming Monster Points from descends (vs PreDRA Infestation) as well as comparing 100 MP vs +1 selling. Playing with myself has never felt so good nor satisfying and it took a few trial runs in the Legend Plus difficulty to determine the needed HP to survive DQ Hera’s preemptive without a shielding sub. Bane from the old Batman Collab is used to bypass the PreDRAs on floor 5. It is also worth noting that B/L Hermes and his Devil Killer awakenings are incredibly powerful in a dungeon where every floor is a devil. For further reading, check out my Hermes Evolution Comparison Post. This may be an ambitious goal, but one of the more appealing aspects of Puzzle and Dragons is the challenging grind and milestones I set for myself. Furthermore, being able to collaterally save up for my second Monster Point Dragon while obtaining a highly coveted max skilled monster is simply Mantastic. You can also use this logic for other descends if they drop other bosses who can be sold for 100 MP. 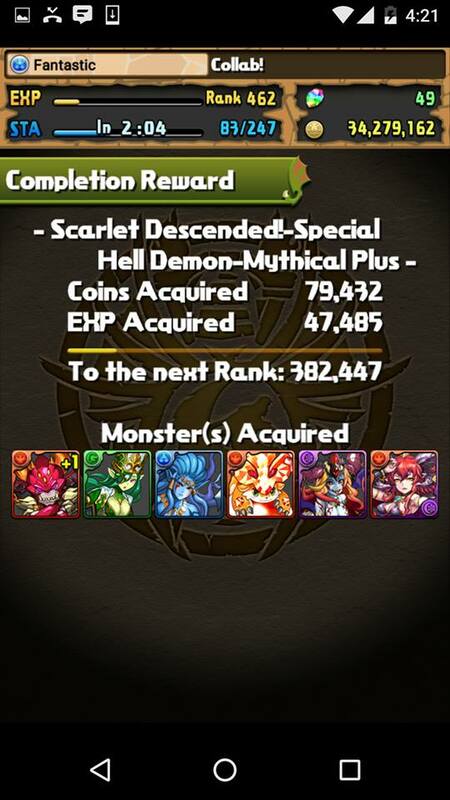 Rogue descends on Mythical-Plus difficulty always award a 500 MP PreDRA along with additional drops for 25 stamina in coop. Rogue descends include Scarlet, Zaerog Infinity, and the other dungeons where your monsters start at level 1. Let’s say you only receive the 500 MP and no additional drops (or wish to try and skill up the boss) would net you 20 MP per stamina spent. This climbs to 802/25 = 32.08 for selling everything from Scarlet Descended. Conversely, PreDra Infestaion yields on average 433.3 MP per 50 stamina run or 8.67 MP per stamina. Both have different benefits outside of Monster Points so the decision is up to you as your situation / skill level / box requirements differ from your peers. If you want more information, please read my PreDRA Infestation Post. If you are unable to consistently clear/farm the rogue descends, your next best bet is to play Descend Carnival during times of increased drop rate as you can yield 500 MP per run through the 5 boss drops. Just make sure you play the difficulty you can reliably clear. This is going to be a frequently asked question during 10x plus eggs in descend dungeons as all the 100 MP monsters will come with a +1. This can be challenging to answer properly as everyone places a different value on pluses and Monster Points. However, you should keep this in mind: +297 = 29,700 monster points. To acquire 29,700 monster points through magic stones and the REM, you need on average 30 stones as each roll is on average 5,000 MP. From there, how many pluses can you expect to obtain from 30 stones? If your base stamina is 150 and each descend yields 5 pluses per run, each stone is 15 pluses. Thus, 30 stones would equate 450 pluses and this number only grows with higher ranked players. Of course not everyone stones for stamina and it comes down to what you need more: A powerful monster/team of +297s or the long term project of 300,000 MP for a special dragon. To be honest, the pluses now will probably serve you better as you can begin clearing harder content to unlock better rewards or start farming rogue descends which are heavily gated by plus eggs as your monsters start at level 1. 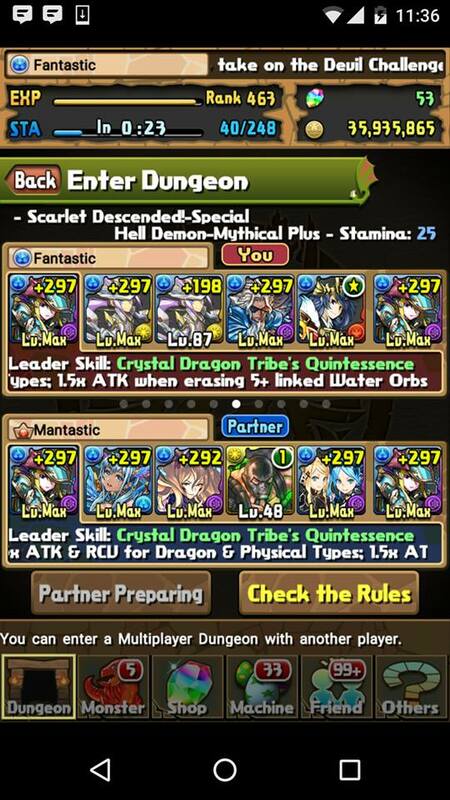 Let me know your plans for 10x MP from descend bosses and whether you will keep the plus or cash in for 100 monster points. That was ridiculously smooth! Congrats. Nice video and very informative. Thank you and keep up the excellent work!